Good evening everyone. Welcome all of new readers to Wildcard Weather. Let’s start tonight’s post with a question. What is a monsoon? If you do not live in an area with a monsoon, its quite understandable to never come across the term or have any idea what it means. But don’t feel bad, many people living in affected reasons don’t know the true meaning of the term either. A common answer to the question is the annual desert rains, or the flooding summer rains in India. While these are real monsoon impacts, the truth is you do not need enhanced precipitation for an active monsoon. This is because monsoons are actually a change in wind patterns! They are regional changes in wind direction and speed that shift rainfall from one location to another. In the image below you will see that the majority of the African continent is affected by the monsoon, but it is only West Africa that sees the true monsoon rains. 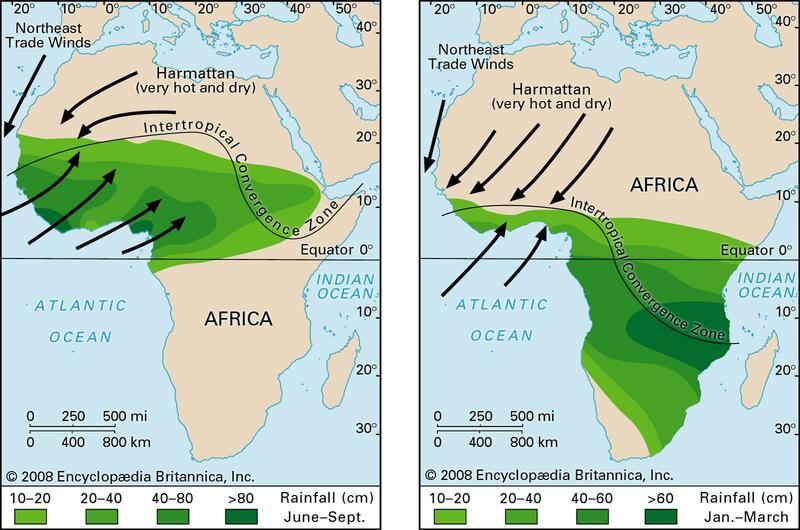 The left image is rainfall during the West African monsoon. It typically begins in late June and will last until October. 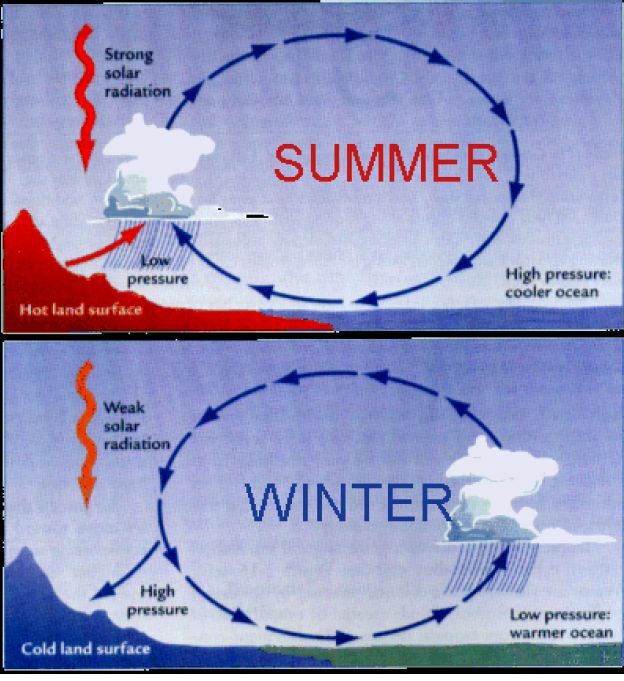 The right image rainfall during the Northern Hemisphere winter. Major monsoon patterns exist in India, Australia, and West Africa. North America’s is quite minor in comparison and there is actually still some debate over whether it is a true monsoon. To begin to understand the cause of monsoons, let’s use the world’ most famous example: The Tibetan Monsoon. No monsoonal pattern is larger and affects more people. It is a very complex process but for the purposes of this blog, I will try to simplify it as best I can. 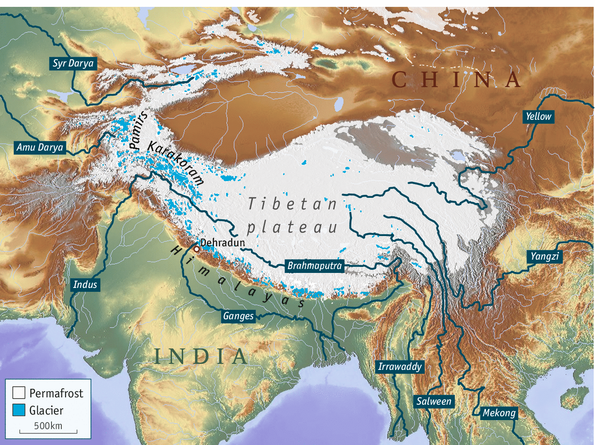 Location of the Tibetan Plateau. As the Northern Hemisphere summer (June-September) arrives, the elevated plateau of Tibet warms with the increased solar radiation. The hot air atop the massive plateau is less dense than the cooler air over the Indian Ocean, and this gives it a lower air pressure. Since wind brings air from high to low pressure, wind patterns adjust to begin flowing northward across India and up the slopes of the Himalayas and Western Ghats.When the moist, tropical air begins traveling up the slopes it quickly cools, condensing all of its water vapor into rain, and lots of it. The Western Ghats is the mountain range running along India’s western coastline. It is the position of these mountains that causes the often torrential flooding in cities like Mumbai and Panaj. An easy way to think of it is like a massive (MASSIVE!) sea breeze. With a sea breeze, winds flow inland during the day when the sun heats the surface. It is a small pattern and lasts only a few hours. With the Tibetan Monsoon the pattern is huge and lasts a few months. Look familiar? Its the same alternating pattern as a diurnal sea breeze. 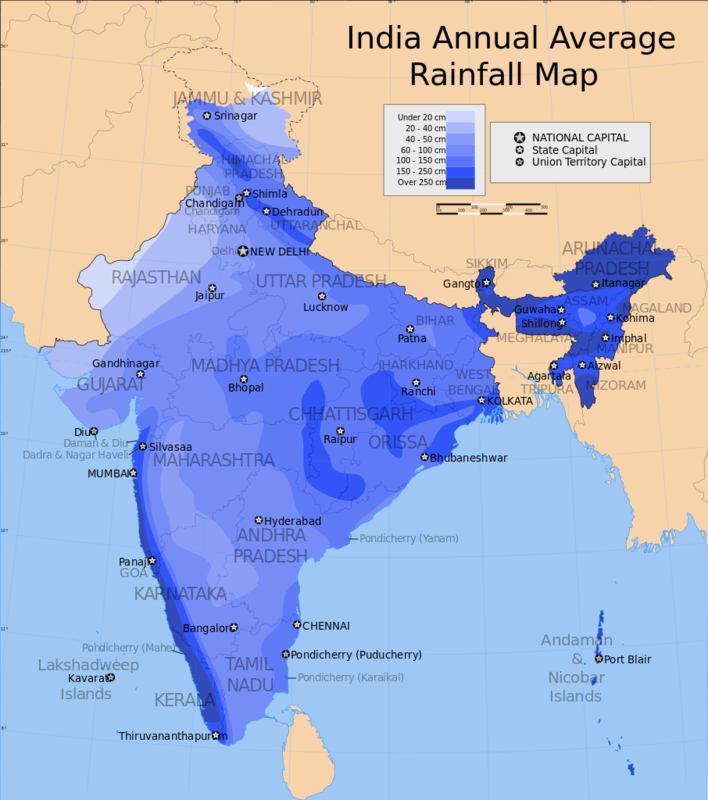 Annual rainfall across India. The high totals in the southwest and northeast are almost entirely from monsoon rains. So what happens in North America (namely New Mexico, Arizona, and S0uthern California)? Despite the change of scenery, the cause is the same. The plateau of the American southwest heats up during the summer months (July-September). This creates that same broad area of low pressure over the southwest and sets up a pressure gradient to the east and southeast. Air masses from these directions are going to contain more moisture than wintertime air masses from the west and northwest. The following images are by Jeff Hawks at theweatherprediction.com. They show the different moisture sources for the North American monsoon. 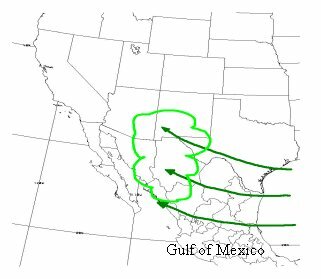 Under the right wind patterns, the Gulf of Mexico can be a near endless source of moisture for the American southwest. 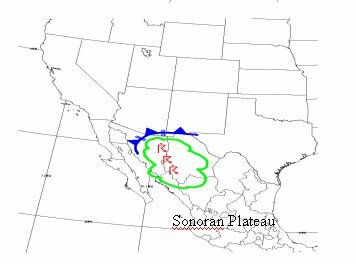 Under this pattern, tropical rains from the Sonoran Plateau travel northward. 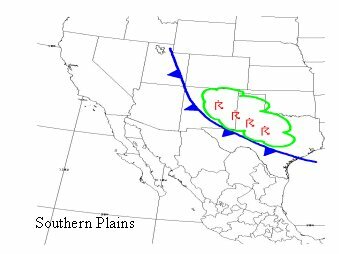 Here, a backdoor cold front is bringing moisture in from the southern plains. I would suggest checking out theweatherprediction.com if you are looking for a slightly more technical explanation. The short and sweet of it is elevated terrain gets heat up by the sun and creates a region of low pressure. Since air travels from high to low pressure this low pressure region changes regional wind patterns. For many locations, the change in regional wind patterns brings in additional moisture and monsoon rains. The monsoon rains are incredibly important to this region. Plants and animals alike depend on it to provide water for the entire year. Below-average precipitation during the monsoon season can result in serious droughts. Check out this article from phys.org to learn more. I’d like to finish tonight with a couple pictures I took of the monsoons this year. They’re not professional quality but they still amaze me. Coming from the northeast it was very rare to see such well-defined rain shafts. Thanks again to all our new readers, and don’t forget to follow on Twitter!